The following is an article from Bruce Crosby. The E-10 was one of a series of new concept tanks which was meant to simplify production. It was to be a turretless light tank destroyer/recce vehicle, designed by the firm of Klockner- Humboldt-Deutz, which up to this time did not have much experience of building AFV's. The engine was to be a rear mounted Maybach HL 100 of 400 HP or an air cooled Argus of 350 HP. The combined hydrodynamic transmission and steering unit was to be made by Voith and was also at the rear of the tank, easing removal and servicing. This would also free up space in the fighting compartment. The engine deck and rear plates could all be removed to allow access and the engine and transmission could be removed as a single unit. It was expected that the top speed of the tank would be 65 - 70 km/h. Even though the E-10 designation would suggest a weight of 10 tonnes, the combat weight would probably have been about 16 tonnes. The gun was to be the 7.5 cm Pak 39 L/48, in a mount similar to that of the Hetzer. It may have been replaced on the production lines by the rigid mounted (Starr) version of the same weapon. The suspension was by bolt on external units which used Belleville washers as the spring medium. There were four units per side, each fitted with a single 1000mm diameter steel tyred wheel. The wheels were alternately offset on the axles to straddle a single guide tooth track. One feature of the tank was the ability to reduce its height. This was achieved by rotating the pivot points of the suspension units via cranks driven by hydraulic actuators. The vehicle height could be reduced from 1760mm to 1400 mm. The armour was to be 60mm thick on the upper glacis plate, 30mm on the lower glacis plate and the rest all 20mm. 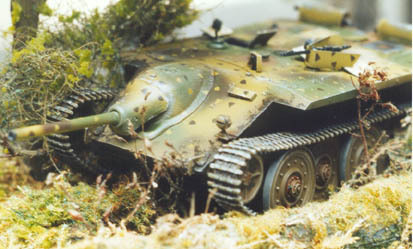 The E-10 did not go into production and its projected role was to be undertaken by the similarly sized but mechanically simpler Jagdpanzer 38(d), based on a re-engined and lengthened version of the venerable Panzer 38(t) chassis.